Finding that perfect gift for any event can be stressful and difficult. Here are some tips that may help you narrow down your choices and figure out just what to give! Break down who the person is – female/male – are they athletic, what are their hobbies, do they have any needs with regards to their home, etc… Once you think about the different aspects of a person, sometimes, the perfect gift presents itself. Do some research – ask their friends, relatives, neighbors, etc. This can open up other ideas that you had not thought of. Also, ask others for their opinions of gift ideas. If you are trying to buy for a wedding, you might want to ask the coordinator from the event facility for suggestions of things they have seen given as gifts in the past. Go shopping with the person you are buying a gift for and listen to what they gravitate to, what interests them or if they put out any wishes for things. Think of shopping on-line at personalized stores that offer monogrammed items or other personalized gifts. If there is a registry available, purchase off of it. 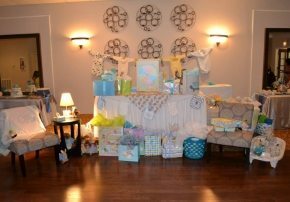 It may not be as personalized as you wanted, but it will definitely be something they chose and either want or need. If all else fails, ask! Whatever your occasion, good luck with your gift buying! We are sure you will make just the right choice!